GAINESVILLE, Fla. — For most her life, Crystal didn’t spend much time in the produce section at the grocery store. “I thought fresh fruits and vegetables were too expensive, so I didn’t usually buy them,” she said. But then she started attending cooking and nutrition classes offered through a Palm Beach County food pantry, and her thinking changed. “They showed me how to shop on a budget by using the weekly store flyer, using coupons and looking at unit pricing. They also made me aware of local pantries that provide fresh produce, not just shelf-stable canned items,” she said. Crystal is one of more than 800 Palm Beach County residents who have graduated from a free eight-week program offered through the University of Florida Institute of Food and Agricultural Sciences Extension. 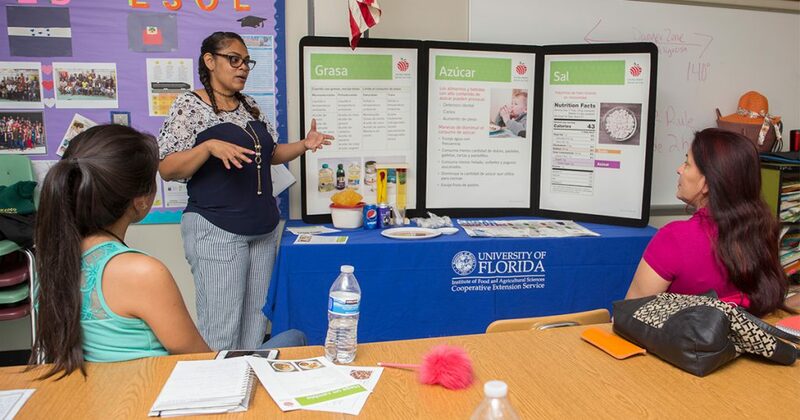 The UF/IFAS Extension Expanded Food and Nutrition Education Program (EFNEP) partners with community organizations to provide evidence-based nutritional education to low-income families in six Florida counties. Crystal signed up for the classes because her family is overweight, and she wanted to learn how to make healthier meals for them. As part of the class, participants are able to try different healthy ingredients and learn how to turn them into a meal. In Palm Beach County, EFNEP classes like those Crystal attended are provided in partnership with the Palm Beach County Food Bank. This partnership is called the Marjorie S. Fisher Nutrition Driven, a mobile food pantry that provides food insecure areas of Palm Beach County with nutrition education as well as fresh produce and whole grains from the food bank. Participants in an EFNEP class learn about fat, sugar and salt in the diet. In Palm Beach County, EFNEP classes are offered in English, Spanish and Creole. Hands-on experience with healthy foods is part of what makes EFNEP so effective, said Danielle De Vries-Navarro, EFNEP agent for UF/IFAS Extension Palm Beach County. “One of the barriers to better eating is feeling like you can’t afford it or you don’t know how to prepare certain foods. So, while we’re explaining the benefits of eating more fruits and vegetables, we’re showing how to use the fresh eggplant that was just donated to the food bank in tonight’s dinner,” De Vries-Navarro said. In addition to healthy eating, EFNEP educators also show participants how to work physical activity into their everyday routines. Crystal’s case isn’t unique, De Vries-Navarro said. “Our data show that most of our participants have adopted one or more healthy lifestyle changes since completing the program. Almost half of them increase their fruit and vegetable consumption and physical activity levels,” she said. Crystal and her family are already seeing the benefits. “I lost 14 pounds, and my daughter lost 7 pounds. I’m excited to do more things for the health of my family,” she said. To learn more about EFNEP programs, visit http://efnep.ifas.ufl.edu.